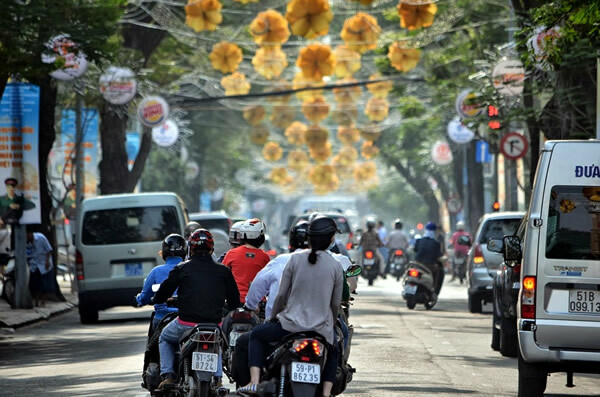 A street scene in HCMC. I was on the back of an old Russian motorbike, which growled into the wind. Dressed in just a t-shirt and shorts, and feeling the usual twangs of fear I feel when traveling fast on any vehicle. Nevertheless, I couldn't have been happier. The sun was shining down on us as we wound our way along roads that skirted the edges of limestone Karst Mountains, which rose out of the ground like the humps of some mighty dragon. Every now and again, the land would level out and a patchwork of emerald rice paddies, surrounded by flowers, would be laid out before us. I was relieved to be seeing this side of the country, to be out and on the open road; everything seemed so different compared to life in HCMC city. 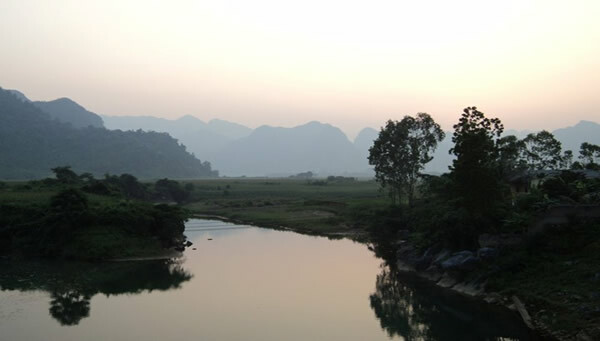 Mountain countryside outside of bustling HCMC. Photo by Angharad Bates. There were many times living in the bustling metropolis of HCMC when all I wanted to do was leave what I felt to be a polluted mess. I longed for parks and beautiful buildings, and for less traffic and mayhem. People seemed to drink too much while others were mugged. At other times, the raw energy of life played out in the streets instilled awe and inspiration. I would drive home from work fully appreciating the chance to live in such a fantastic part of the world. We had decided to move to Vietnam after the country was recommended by a friend. She had apparently had the most remarkable time and even managed to save some money in the bargain, a winning combination by most standards. It took a while to find enough hours of work to suit us, but only a couple of days to have found a nice apartment and a roommate. I went on to stay for two years. Near the end of my time in HCMC, a friend decided to drive to Hanoi, an epic adventure that would last for a week. The voyage instilled a newfound love for Vietnam and the Vietnamese people. Now that I am no longer there, I dearly miss the mayhem, the traffic, and the strength of the people. I yearn to go back. I suppose everyone does who lives in a place for some time, just as many experiences create paradoxical sentiments when moving to a new and far away home. Those looking for work should note that the key is to put in a lot of legwork (or motorbike work as the case may be) in order to find a job. Many language schools prefer to see prospective teachers in person. Most don’t hire from abroad, and many are hopeless at replying via email anyway. Arriving without prearranged work may seem like a daunting prospect, but if you hand out enough CV’s and have reasonable credentials you are almost certain to find work. The best thing to do is to check the addresses of ten or so schools and pay a Xe Om (motorbike taxi) to take you to each one in order to speak to them in person. A couple of hours being driven shouldn’t cost more than about 5 dollars, which is definitely a good investment. The other advantage in approaching schools directly is that you can develop first-hand impressions of how the building and classrooms appear, how professional and friendly the staff seems, and catch sight of some of your prospective students. Wages are normally around US$12-$20 an hour, depending upon qualifications and experience, with a lucky few securing up to $30 for private business classes. Although it is generally required that teachers have a degree and a CELTA/TESOL certificate, it is still perfectly feasible to find work without such credentials, albeit usually at some of the less scrupulous schools at slightly lower wages. The same can be said about work permits. Only those schools in the upper echelons of the education industry will require teachers to acquire a work permit. Most will allow teachers to work on an easily renewable tourist visa, simply because the cost and bureaucracy involved in applying for a permit would otherwise put potential teachers off. Of course, apart from language schools, there is also the option to organize your own private classes. These often pay more and are usually one-on-one. The most common way to set up such lessons is through word of mouth. If you stay in the city long enough, someone is bound to ask you for such lessons, and if you are good, news spreads fast. Once you make inroads in the private class sector, things can become very convenient, as many of the affluent in cities live together in suburban tower blocks. Therefore, you may get very lucky and work a few hours a day in the same place, cutting down on travel time and money. See Top English Teaching jobs in Vietnam for more job postings. 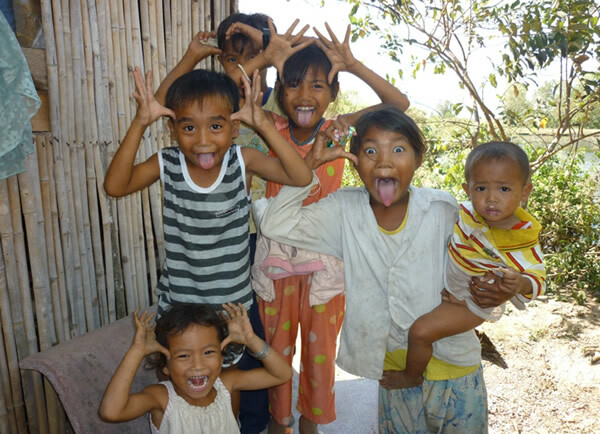 Playful children making faces for the camera. Photo by Angharad Bates. HCMC offers the whole spectrum of accommodation options, from US$3,000 a month luxury penthouses to rooms in shared houses for US$50. If you’re looking for a decent apartment for a couple of people, expect to pay around US$400, which will also depend on where you want to be based. The city is split into different districts, with 1 and 3 being the most central. Both are made up of a nice mixture of shops, restaurants, and hotels. Those on the main streets are more exclusive, while stores become more local in nature as you head into the back alleys. This means you can have the best of both worlds, indulging in a 3-course French meal served on a rooftop one day, and sample cheap local delicacies the next. District 1 also houses the backpacker district of Pham Ngu Lao, a good place to meet foreigners, network, and get advice. Being central, these are also some of the most expensive areas, but you pay for convenience and the modern ambiance. It’s easy to sit in a bar in Pham Ngu Lao or district 3 and meet potential housemates or find out about jobs. If, on the other hand, you like greater cultural immersion, Districts 4 and 5 will offer you that experience, coupled with a cheaper price tag. District 4 is across the river, and due to being the site of the former port, it has retained an atmosphere reflecting its previously dodgy reputation. However, since it’s no longer a port, and the unsavory characters sometimes found in ports have moved out, the reality is now wholly unfounded. I lived there for a year and found it cheap and cheerful. District 5 is home to Chinatown, and so this makes it a colorful place to live, stroll and browse. There is plenty of good shopping, and literally hundreds of hole-in-the-wall restaurants and street vendors. Skipping straight to the other end of the spectrum, if you feel you might want to escape from the raw street energy on occasion, you should consider Anh Phu. It’s quite a drive across two bridges, but you emerge into a far more open plan, amid a calm oasis of luxurious apartments and upscale restaurants. There’s also a range of social clubs here for new mothers and those interested in yoga or meditation among other things. Finding accommodations is not difficult. Apart from word of mouth recommendations, there are a plethora of agents who work specifically with and for foreigners. This greatly eases the stress of being a new arrival in a new city helps handle the language barrier. Once you have sufficiently settled in, the only thing left to do is rent yourself a motorbike, take a deep breath and explore the city. Angharad Bates has returned from Vietnam and retreated to the more soporific realm of the London suburbs. While currently spending her time flitting between Southern Spain, Sweden, and the UK, she manages to split the remaining few days working as an English teacher and a part-time travel writer. She is optimistic about an upcoming move to Andalucía to live in a yurt.